My Brother feeds Al his Icy Pop. He always told Mum Al was his favourite dog ever. As mentioned previously, as a child my brother was an idiot and never felt bound by the natural laws of physics. He was always attempting to break or injure something on his person. Twice he got hit in the mouth with a swing. Another time he busted his teeth out coming off a skateboard. Mum worried about him turning out OK, but now he plays guitar and hosts parties where all you do is throw cake at everyone. Or ride around naked on bikes while friends pelt you with heavy objects. Perfectly fine. Maybe it’s a family thing. My grandfather decided he’d try breaking concrete with his skull one day running outside in the rain. Concrete: +1, Neck Vertebrae: 0. Awesome terrorist beard that spread like wildfire under the neck brace for 6 weeks: +9. When my brother broke his arm he was in the middle of trying to pole vault off a tree stump with a 6ft wooden pole. Rocket Scientist. As I was too terrified smart to do it myself, I stood back and offered safety advice like “higher!” and “now with no pants!” He never got the chance to attempt either. He disappeared behind the stump on what became his final vault. I heard an almighty crack as he hit the ground as the pole snapped in two. I broke my own wrist once, international man of adventure that I am, by tripping on the High School field and landing on the grass. Real tough. Bones made of balsa wood. Maybe UFC have a ultra-balsa-weight class I could join. I’ve already been through how fast I was as a kid. Suffice to say it was almost the speed of light. I passed 2012 on the way. The only things slowing me down were fences, my fake $2 Reeboks that had grip like butter on ice, and slippery cement. Overwhelming odds. To elaborate, everyone forgot to tell Bolivia about the existence of sand. Not a grain to be seen. So all their cement is smoother than glass. They press holes into it while wet to make some grip, but they wear in time so you’re back to glass. There was always some old tourist lady slipping at school, or downtown, or in her sleep, but there was nothing you could do, save importing your own sand one pocketful at a time, like that guy from Shawshank. I’m sure all he wanted to do was sprint around the yard without the threat of slipping over and looking like an idiot. I’m pretty certain I arrived home before I left, that’s just how fast I was, despite a harrowing experience involving the glass-crete and what some seconds before had been a fully functional hip joint. I hobbled into the Kitchen and yelled “Dad!” To which came the sarcastic reply: “Ard!” …Now, I could interject here with a ‘boy who cried wolf’ lecture, which we don’t have time for; but obviously Dad had heard that tone from me before and completely ignored it, apart from the brief mockery. After some continued pleading and perhaps a big case of the puppy dog eyes, Dad finally believed me and ran out to get my crumpled brother, who had since hit puberty and grown facial hair in my prolonged efforts in pressuring his father to get him some help. I was still exhausted from my supersonic run, so I remember nothing of what happened next. I think Judy made some kind of splint from matchsticks and toothpaste (she was like our Macgyver) and they shuttled Capt. Broken off to the hospital after finding some coins for the bus. I was stuck at home looking after my sister, who we usually forgot about because all she ever did was play in her room with the plastic bag she got for Christmas. She was creative though, and made dresses to wear, scuba masks, balaclavas… all kinds of stuff. Anyway, hours later they finally returned from the hospital with my brother’s arm in a cast. …That came out wrong. It was still attached to my brother and everything. The Bolivian standard of medical care isn’t that bad. The point is, he had a cast on, idiots. The best bit was when the doctor had told my parents to keep his arm elevated overnight after they got home from the hospital. For those planning for such an event, the obvious thing to do was TIE IT TO THE CURTAIN ROD. Thinkers those two. At least the curtain rod now had purpose in life. He slept all night in the moonlight with his arm all strung up like he was in traction. In the morning that thing was black and smelled vaguely of death. And he no longer had any feeling in his fingers. We used his hand for piranha bait for years after that. Arm ended up healing ok though, aside from a slight bend which came in handy down the track for break-and-enters. The moral is, I pretty-much saved my brother’s life through selfless quick thinking and an altruistic hunger for action. More of us should be more like me. And less like that Twilight guy. 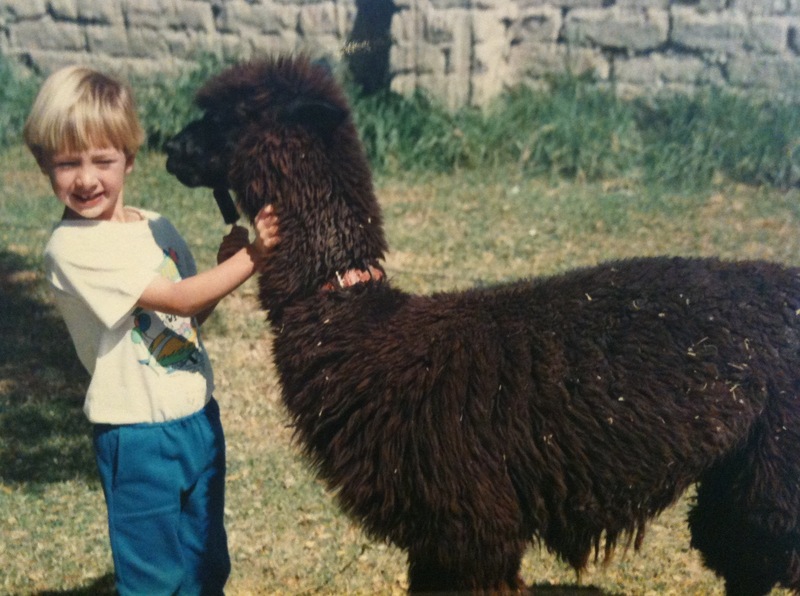 Posted in BoliviaTagged alpaca, broken arm, cake party, hospitalBookmark the permalink. I’m in tears … lying down on the kitchen table to catch my breath! Is it only me who thinks you are hilarious? Oh gosh … whew. No, everyone thinks I’m hilarious. They just don’t know it yet.